Remember how ridiculous the special effects in the bootleg trailer for Empires of the Deep looked? No? You should definitely refresh your memory before continuing. Originally announced in 2009 little, beyond that bit of leaked video, has been heard from the production. There have been changes both behind and in front of the camera but Chinese real estate giant Jon Jiang, who is said to have financed the movie out of his own pocket (if you have the money, anything's possible), has kept the wallet open and production moving. The result is this new trailer which looks remarkably like the leaked footage from two years ago, bad quality and all. 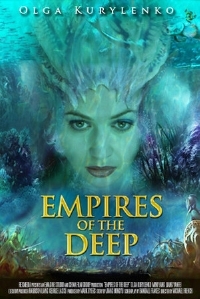 It's unlikely this will ever see the light of day in North America but Empires of the Deep could be fun after a night of excessive drinking or maybe as part of a night of excessive drinking. I'm actually curious to see just how badly $130 million dollars looks on screen. Here's a taste.